Globally, modern organisations employ a ratio of knowledge workers to manual workers that has accelerated upward from 2:1 since the 1980s. Knowledge as a business asset has never been a more valuable commodity in the private and public sectors than it is today. Unfortunately for most organisations, staff turnover results in volumes of information walking out the door in the form of individual knowledge, with only a small percentage of it retained. Often attempts at organisational knowledge retention rely on reactive last-minute activities such as employee hand-over training or exit interviews. This framework describes a complete information management methodology suitable for any organisation interested in converting the knowledge of individuals into organisational knowledge, and applying that asset to improve process efficiency, internal innovation, and day-to-day operations. This section discusses how information is classified, the different types of “info”, and the purpose and value of each type. A datum is an individual unit of info. Every datum consists of two components: context and value. Information is the name for the relationships between data. A datum on its own does not convey enough meaning to be useful. Information occurs when data is arranged and combined in a way that creates connections between data. These facts above are comprised purely of data that are connected in meaningful ways. Information can be communicated easily and simply by humans. It can also be of huge complexity (many connections between data) or simplicity (fewer connections between data). Knowledge occurs when patterns of data relationships are created. This is the sophisticated product of logic and reasoning, and happens naturally through the cognitive process when information is received in the brain, or in a computer through use of data input and algorithms. Knowledge is the ability to recognise patterns in information -- patterns in the connections between data. Kyle is unable to drive his red Ferrari because he is in a different city to the car. Knowledge is acquired through reasoning (deductively as in the example above, inductively, or abductively) by thinking about the relationships between different pieces of information to identify patterns therein. Knowledge is produced internally, and communicated interpersonally in the form of information, or in encoded form (as between computers) as data. Once knowledge has been acquired (as in this example), a subsequent discussion on the topic of another sports car would mean that not only are this pattern of data is already known (and their values can easily and rapidly be learned) but the relevant connections between those data are already known, from which additional conclusions can be drawn once those data values are known. 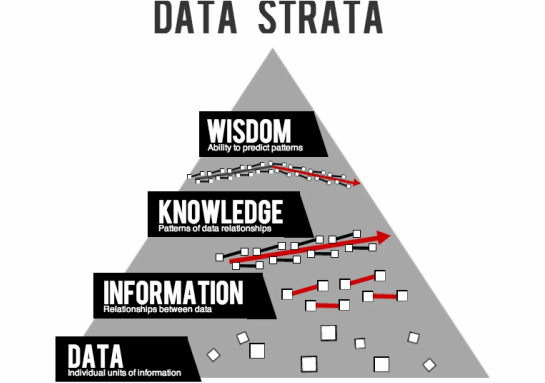 In this way, knowledge speeds up the information acquisition process because the only unknown is the relevant data-values; the data-context already exists in the known information pattern. Wisdom is the ability to predict new patterns based on existing knowledge. This can occur by combining observable patterns in new ways, by generating new patterns, or by examining existing patterns with new perspectives. Wisdom can most simply be described as good judgement; it is the result of knowledge accrued by experience. Kyle is likely to have recently acquired formal ownership of his red Ferrari, but has not received the vehicle itself yet. Using the semantic definition (rather than the various spiritual or religious usages of the term “wisdom”) wisdom is neither rare nor difficult to obtain. It is, however, the most complex form of info, and therefore the most difficult to transfer between sources. The primary difficulty of communicating wisdom is that, like knowledge, it must be broken down and conveyed as information or data, but also because it relies on pre-existing knowledge in order to be interpreted meaningfully. This management framework deals predominantly at the information and knowledge levels, and assumes (but does not require) a capacity for wisdom among the organisation’s members. This diagram describes the key components of the Information Management process. Dissemination, in which information content is consumed and converted back into knowledge. The process is also divided horizontally along the dotted line to show which type of info is dealt with at each step: Information or Knowledge.